Explore strange worlds, escape reality and enjoy a memorable experience. 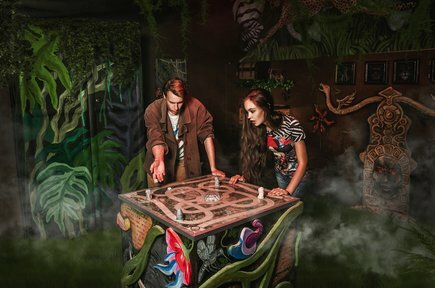 Secret Escape Game Mainz offer exciting adventures and lots of fun. Fight against pirates, explore a jungle or lead an investigation looking for missing children – all you need is some sharp thinking, great teamwork and a bit of luck! Each group entering the Escape Room has one hour to solve all the puzzles. Escape games are equally suitable for groups of friends, families, bachelor's parties or corporate events. As they take place indoors, they give you the option to be active without getting too wet or cold. 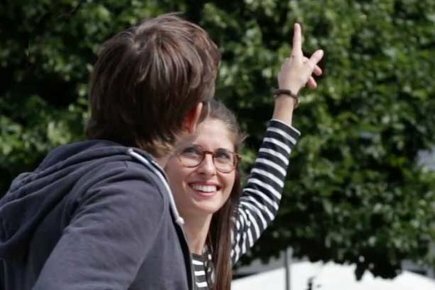 Do you want to explore Mainz in an interactive way? Then get yourself a City & Quest bag from the Tourist Service Center at Brückenturm. It contains everything you need to solve our puzzles and quizzes about Mainz. City & Quest is a great way for visitors to get to know Mainz and to learn about its history and people. The game is also very suitable for children from Mainz as there are many fascinating things to explore that they might not yet know. In the summer, we have a special treat in store for all those who love Mainz and its river. 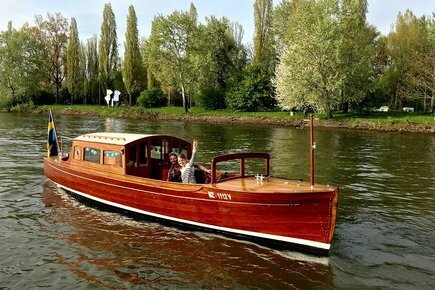 Sail on a fully restored boat from the 1930s to see and explore Mainz from the water. This guided tour has something to offer for everybody. Tapping into the real spirit of Mainz, local wine and food is served on route. Enjoy the company of a knowledgeable and witty tour guide who will let you into a few secrets of the city. We offer tailor-made tours for groups. 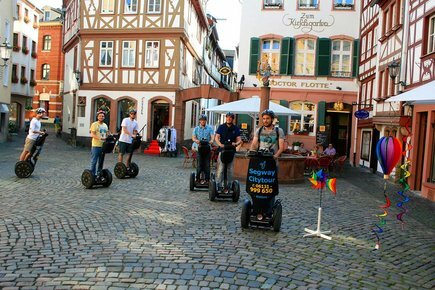 Accompany our tourist guide and slide on a Segway along the Rhine and through the picturesque squares and lanes of the old city centre, exploring its hidden corners. All while manoeuvring a Segway, which is great fun in itself. Tours for groups on request; please contact gaestefuehrung(at)mainzplus.com. The BierBike is a huge bicycle for up to 16 people. While 10 people do the pedalling, the others can relax, enjoy some food and of course some beer from the on-board kegs. Sitting along the large wooden bar counter under a timber roof, you will not be able to escape the rustic charm of this unusual vehicle. 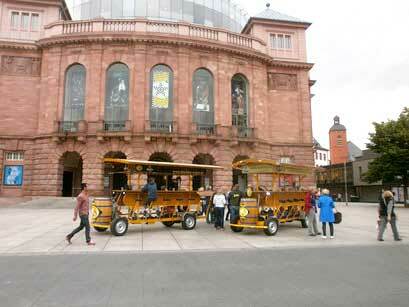 Exploring Mainz on the BierBike is an experience you will not forget quickly! "How Henne Gensfleisch became Johannes Gutenberg"
Find out where Gutenberg lived and worked, what he spent his money on and why he nearly missed out on a fortune. See one of the most famous bibles in the world on display at the Gutenberg Museum and learn how printing was done at the time of Gutenberg. What is Johannes Gutenberg's full name? What are the ancient vessels for wine, oil and cereal called? ... 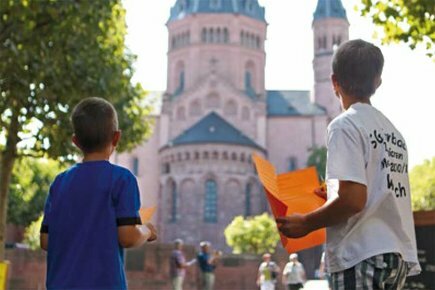 Follow historic trails and learn all about the history and people of Mainz by answering these and many other questions. Entertaining rally through the city. 25 sheets with questions, plus answer sheet. "Come and walk in the footsteps of Gutenberg!" 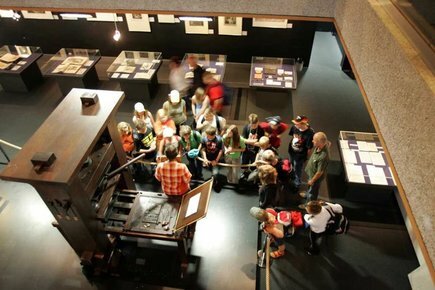 Avail of a great educational package covering a guided tour through the Gutenberg Museum and the printing shop. Children learn about printing techniques and history while engaging in activities they enjoy. This package has been devised specifically for school groups. An experienced tour guide and contact person makes it easy for teachers to organise the trip. For smaller groups, the price per person is higher. Larger groups can be divided into several subgroups. 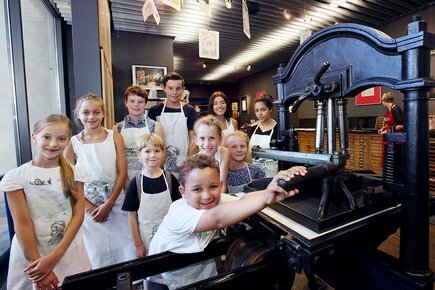 Every second Saturday in the month, at 2 pm, we offer a guided tour through our museum including a printing demonstration and hot lead type casting for children. By now there are only few people who know the corridors and vaults under the city. Who built them and why? And why is there an underground "little moated castle"? 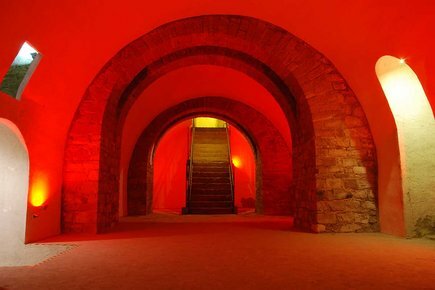 Discover the area below Mainz and learn about the diverse history of the "underworld": The association "Mainzer Unterwelten e.V." offers guided tours with different Topics. - Dive into the underground and become an insider. 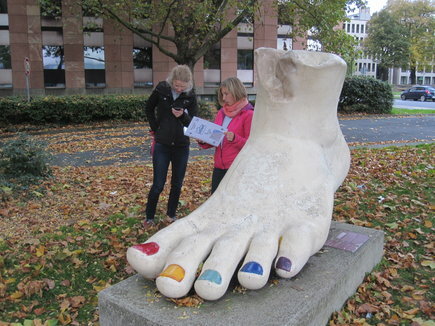 Download our audio tour app (from www.app.lauschtour.de) and discover Mainz on your own – accompanied by a knowledgeable tour guide on your phone. The voice you hear is that of city tour guide Matthias Opple who knows Mainz inside out. The tour takes about an hour and brings you to all the must-see sights in the old city centre. Among the topics covered are the famous carnival of Mainz, the Roman history of the city and the magnificent stained glass windows in St. Stephen's. There is also an audio tour app for the Gutenberg Museum where curators and the director herself tell you all you want to know about the main exhibits, such as the Gutenberg Bible and the museum's treasure trove of Islamic books. We also offer a highlight tour (20 minutes) about Gutenberg and his invention and a few shorter extra downloads on other topics. mainzplus CITYMARKETING GmbH acts as a broker and is not the provider of the actual website service.